1. I miss the friends I made. This was my first time being a part of a group in college and I wish I did it sooner. After coming home, I missed the people from the trip so much. I wish we all lived closer and went to the same college. Life gets in the way but we do try to stay in touch with each other. Experiencing everything with those people made the whole trip even better. I will forever look at the pictures and memories as one of the best times of my life. 2. The beautiful views. The cities and sights I saw were beyond incredible. Just in my home stay town of Bregenz was beautiful. We had the Pfänderbahn and other surrounding mountains that were incredible to look at, as well as, Lake Constance. We even swam in the lake multiple times. Traveling to cities like Prague, Munich and Venice all had different types of architecture that you just don’t see while in America. 3. The food. Oh my, the food was great. German food is centered around meat and potatoes, which is what I live on. But also, the freshness of the food. Europe, in general, does not have as many processed food options as America. They don’t keep as much food on hand. Plus, most of them have smaller refrigerators so they physically cannot keep a lot of food in the house. They have multiple “farmer’s markets” during the week while we only have them once a week. I noticed that prices of food were cheaper as well. Coming back, my stomach had to make an adjustment which made me look at what I was eating. When I miss German food now, I will dig up a recipe or go to a local German restaurant. 4. Exploring new cities. My program was great because I got to travel on the weekends. I visited other countries and enjoyed each of them. Learning to get around a new city with another new language, new currency and new culture is a hard adjustment to make within 2 days but you quickly make the adjustment and enjoy the changes. Being constantly busy and exploring cities is something I really miss, like any person who has studied abroad. Some things I learned during my time abroad…. Water is not free. Neither is refills. But you can ask for local tap water. You might just get some odd looks though. In Austria, they have fountains around town that are drinkable only if they say “Trinkwasser”. All shops close early and are closed on Sundays. Even the grocery. They celebrate a lot of holidays where everything gets shut down. You will see locals eating gelato and drinking alcohol at all hours of the day. Even at 10am. All toilets will flush differently. Also, not all bathrooms are free. Most public toilets cost 50 cents. Train bathrooms are even more confusing. Each will flush, turn on water and dispense soap differently. NEVER drink water from the tap on a train. When eating out, remember to ask for the check or it will not come. They also tend to be more quiet but that depends on the city and what you’re doing. Wear comfortable shoes. You will be walking everywhere. Try to book rooms and trains as soon as possible. To save money, eat at the grocery store. Very cheap and good food. When packing, bring enough toiletries to last you a month. If not, they are fairly inexpensive to buy. Ask if the bread is free before eating. Sometimes they will charge you. If you happen to have a credit card with no foreign transaction fees, pay with that when going out in large groups. People can pay you in cash and you can avoid all the ATM fees. When visiting another city for a weekend, I recommend getting a metro, bus or tram pass to get around the city. It is well worth the price. Explore your host city as much as possible. Try not to get a routine of same places. Naps will be necessary—but choose wisely when to take them. FOMO is real. Trains are always cold. Take a jacket or scarf with you. On weekends, pack for all weather. If you can’t sleep sitting up, then best of luck on trains. Netflix’s download feature came in handy on long train rides. Being a student-athlete at the University of Louisville, I thought I would write a little about the sports and exercise atmosphere in Shanghai. One often think about the Chinese population as skinny and healthy people. Living in China, I understand some of the reasons why they are so skinny and young looking. Overall, the people take good care of their bodies. The food they eat is very fresh and natural, and they do not eat a lot of processed food. They are experts in making good juices, and herbal tea is an important part of their everyday diet. First time I walked around campus at night, I was shocked to see how many people were exercising around the track and field. We have two track and field facilities on campus and both of them were packed with probably 200 people each. There were people walking, jogging and running in all eight lanes. The age ranged from young kids to really old adults all excited to get their workout in for the day. Neither of the facilities have light, but it seems like everyone likes to exercise at night because that is when they have free time, and when the temperature cools off. Not only were people running around the track, there were also many people standing next to the fence stretching, doing strength exercises, and even some people were doing tai chi. A totally new experience for me, and I suddenly understood why Chinese people usually look so healthy. Not only does the population enjoy to exercise themselves, the support of professional athletics is also increasing. 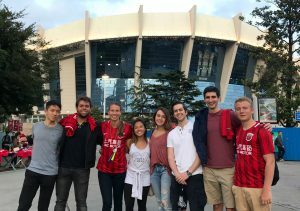 The second weekend in Shanghai, I went to see the the Shanghai professional soccer team play at their main stadium with other study abroad students. The Shanghai team played the 1/16 final in the AFC Championship that night. The stadium was really nice and was actually used during the 2008 Beijing Olympics. China is purposefully trying to increase the people’s interest in soccer, and therefore, the soccer clubs are given large amount of money to get famous international players. Oscar and Hulk are currently playing for Shanghai so it was entertaining to watch. Walking around in Shanghai, you can also see the huge amount of bicycles. There are several bike companies that rent out bikes for less than one dollar an hour, and you can leave the bike wherever you want. You unlock the bikes by using the bike companies phone app which is connected to your bank account. The bike rental system is super convenient, and it is a good substitution for motorcycles, cars and taxis. It is also a way of promoting healthy lifestyle and activity. As you can see, there are many ways the Shanghainese population like to stay active, exercise, and improve their health. After being in Shanghai a couple of weeks, I now know that it is not a coincidence that Chinese people are known for being skinny and healthy. The idea of spending a semester abroad always appealed to me because I was born and raised in Louisville and haven’t been away from this city for more than a week or so. Therefore, coming into college, I knew I wanted to participate in some sort of study abroad program to experience a different city and culture for a longer period of time. Since, my minors are Spanish and International Business, I decided that I wanted to study abroad in a Spanish-speaking country for a semester. I wasn’t completely sure how I would handle the separation from my friends and family for so long, but I knew it was something I needed to do for myself to grow as a person. I spent months planning and debating where to study, which programs to go through, and what classes to take. I reached out to nearly everyone I knew that had previously studied abroad what they did and how their experiences were. I finally chose Sevilla, Spain because I wanted a large city with a smaller town feel that would have a strong Spanish culture. Studying abroad turned out to be the best decision I have ever made. Being independent of my family and friends for an entire semester helped me gain self-reliance and general life skills I never would have gained back home. I’ll admit that I was put in mildly uncomfortable situations on a regular basis…but this wasn’t a bad thing at all. If anything, it taught me a lot about myself and how to handle any situation that is thrown at you. Whether it was miscommunicating with locals on a daily basis or missing the wrong stop on the metro, I learned a significant amount about handling problems and high-stress situations in a calm and logical manner. Additionally, communicating with my host parents and locals on a daily basis helped improve my proficiency in Spanish; however, what contributed the most was the linguistic exchange program I signed up for. It essentially paired me up with a local student from Universidad de Sevilla and I would meet up with her every week and we would go to her favorite restaurants and other spots in the area and I would practice my Spanish and she would practice her English. 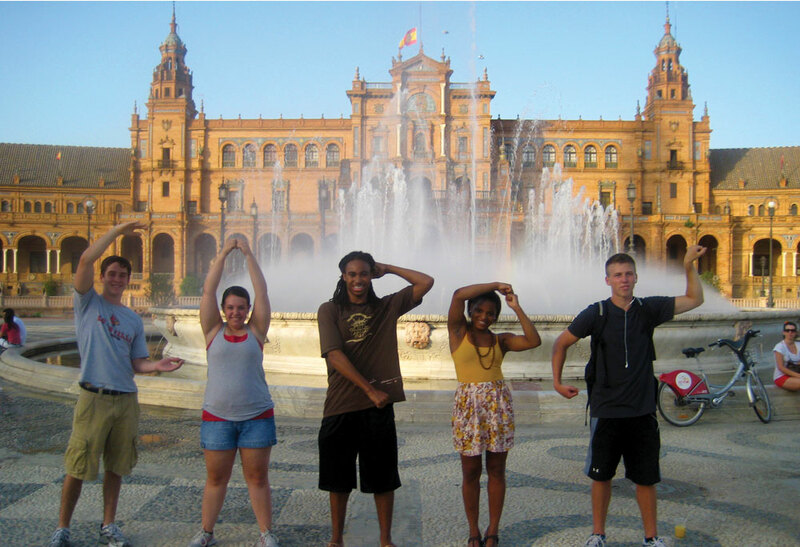 It helped me become better accommodated to the city and the culture of Sevilla. My professors and host parents also showed me the European perspective of the United States which was not only eye-opening but also refreshing to see how other countries thought of us. The classes I took helped me realize that I’m very interested in the concept of globalization and pursuing a career in international business. 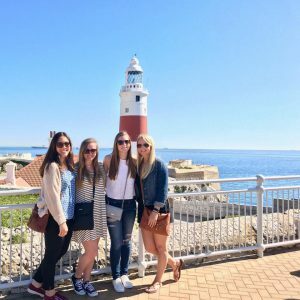 Overall, my study abroad experience improved my perspective on not only business, but the world in general. I think every student should take advantage of the opportunity to study abroad because they will learn a significant amount about themselves and develop general life skills that they aren’t necessarily able to develop in the U.S. You can only benefit from stepping outside of your comfort zone on a regular basis and experiencing new places and cultures however often you can. 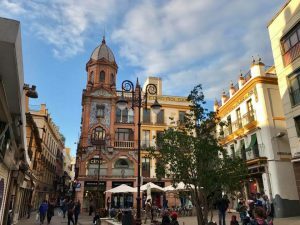 You will probably consume about a million bocadillos during you study abroad experience in Sevilla, Spain. A bocadillo is a sandwich made with Spanish bread and with many different filling options like potatoes, cheese, ham, pork loin and even fried squid. As a study abroad student, you will probably live off ham and cheese bocadillos either made by your host mom or the small little café by your school. Tortilla de patatas is basically a staple in every household and restaurant. It is basically a potato omelet and it is very delicious. Your host mom may make it for you during every meal or she might make it only once a week. Either way, you will always probably be able to eat the entire plate. Speaking of potatoes, you will literally find them in almost every dish, which I am not complaining about. The best is when the potatoes or fries soak up the delicious sauce from whatever dish you order. You can’t leave anything to waste! Pork. Is. Everywhere. Spain, especially Sevilla, loves their pork. They love it so much that you will find it hanging from the ceiling in every authentic tapas bars and restaurants. From jamon iberico, solomillo al whiskey (my favorite! ), pork cheek, chorizo, and suckling pig, you really can’t go wrong. There is always time to have a fried, sugary stick with a cup of Spanish hot chocolate, which is more like hot fudge. You will find them everywhere and they are usually pretty cheap too! One of the main things that I miss about Sevilla is my walk to and from school every day. 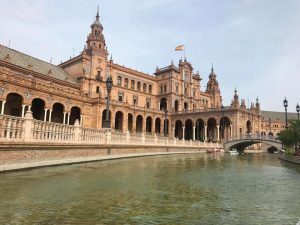 I’d leave my host family’s apartment in Los Remedios, the business district of the city, cross a busy bridge over the Guadalquivir River that runs through Sevilla and connects it to the more touristy part of the city. Then I make my way through Parque Maria Luisa, Sevilla’s principle green area that serves as a botanical garden and has as monuments spread throughout. However, the most impressive part of my walk was when I’d reach the park’s centerpiece, Plaza de Espana. It felt like I was in a movie with how beautiful and scenic everything was. I was never bored in Sevilla. There was always something fun and interesting to do. Whether it was attending a bull fight at the local bull ring, going canoeing on the river, going to Flamenco shows every Thursday night, or even just going to the riverfront to share a bottle of wine with some friends, I always had something to occupy my time with. 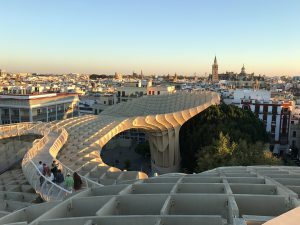 There was even a huge wooden structure in the shape of mushrooms in the middle of the city the locals referred to as Las Setas that we would go to for the best sunset view. I truly miss how easy it was to make exciting and spontaneous plans on a regular basis. There were a lot of students in my program and our housing was separated into four neighborhoods: Porvenir, Nervion, Triana, and Los Remedios. I was able to walk and bike to the other neighborhoods easily, and I always felt safe wherever I went. An area in Porvenir locals referred to as La Juderia (the Jewish quarter) was one of my favorite places to explore because it was the epitome of what you would expect a Spanish neighborhood to look like: narrow, cobble-stoned streets with colorful buildings that were a range of tapas bars, cafes, and boutiques. Staying with a host family definitely had a positive impact on my study abroad experience. My host parents were very caring and dependable and helped get me accommodated to the Spanish lifestyle. Although they were older and felt more like grandparents to me, they were very energetic and always seemed genuinely happy to see me every time I came back from classes or a weekend trip. I made some really strong friendships during my study abroad experience and I think it’s due to the fact that we all bonded over being on our own in a different country for an entire semester. I got to experience so many new and incredible things with the people in my program and I learned a significant amount about myself and about life in general with them.